Frontier has issued a few Signature Edition sets in the past couple of months, using the same basic design from one set to the other, much like they did with the Rookies and Young Stars/Stars and Legends series. The BayStars version brings a welcome change to that trend. The design is much brighter with a touch of traditional/retro design, though the coloring and shadows show that these were designed on a computer. The multi-colored borders may be a bit larger than some would prefer, but given the black and grays of the prior issues, this set feels much sharper. It actually feels like a real design that could be used for a flagship set. The fronts are all English, with the set name at the top, which includes the year and team name. Two flags near the bottom have the player's jersey number and position, with the team logo in the center; the player's name is in the bottom border. Backs have a yellow border that isn't overwhelming (this isn't 1991 Fleer, after all), and a repeat of the photo from the front. I'd prefer a second image here, or some other design usage. 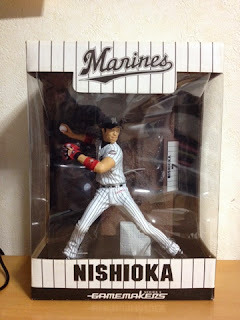 The jersey number and player's name in Japanese characters begins the text box, followed by some biographical information and a short career summary. The card number is in the lower-left on the copyright line. There are 20 base cards in a complete set, and each box contains all 20 base cards. The issue, of course, is about the autographs. One box also contains two autographs; there are 29 different cards in the release, which come from one of three sets. Print runs from the sets varies wildly by player. And while all the sets appear to have parallel versions with red and blue ink signatures, not all players have both parallels in any set. 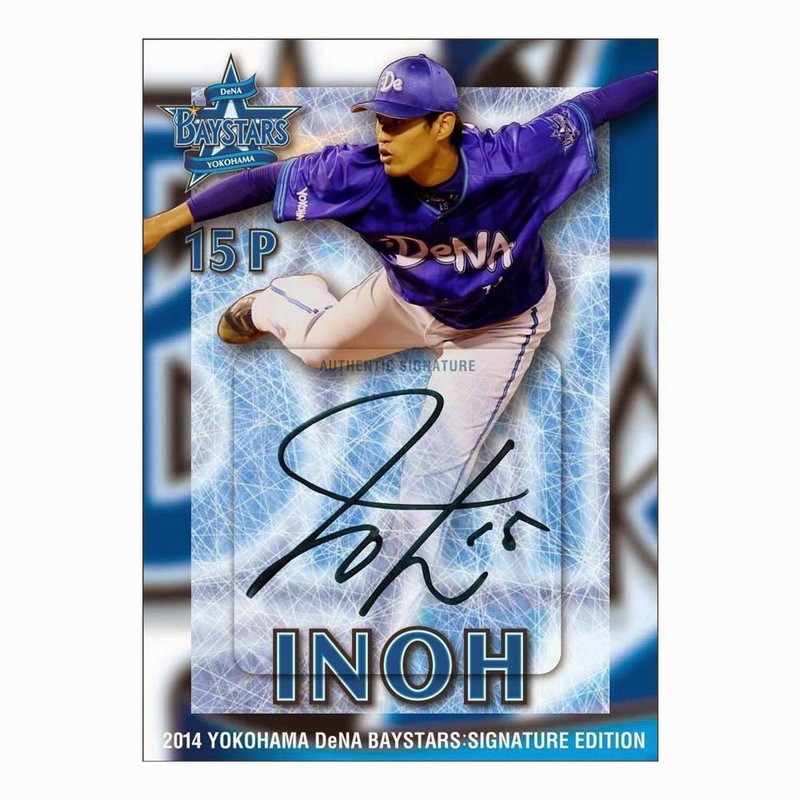 It's very difficult to read the autograph checklist due to its size, but it appears that there are around 626 base sets in all - a very limited release. 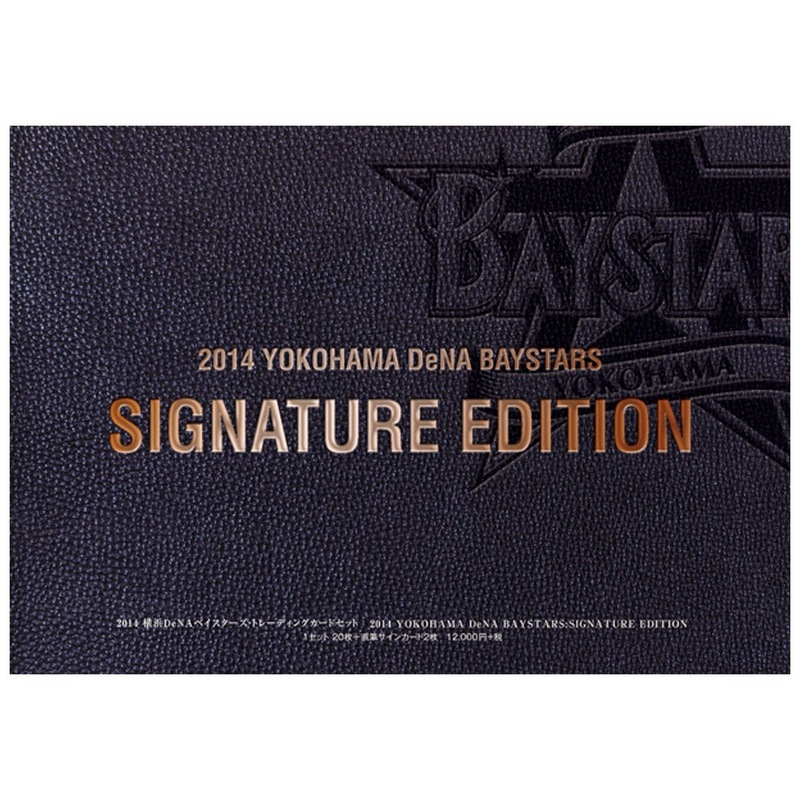 All 20 subjects appear in the Authentic Signatures set. 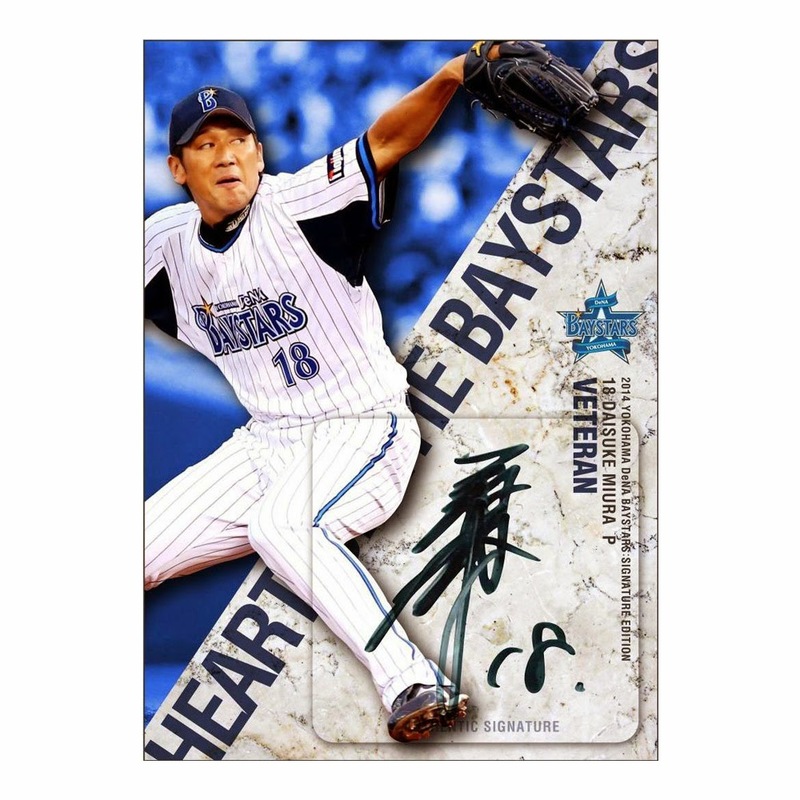 Heart of the BayStars has five different cards. Finally, the dual autographed Rookie Combo Sigs make up the final four-card autograph set. There. I said it. Someone in the baseball card blogging world is a Giants fan. I get it. A lot of people don't like the Giants. It's not as bad as the Yankees, of course. But you have Dodger fans, Oakland A's fans, and those that just can't get behind a team of oddballs. It reminds me of the Phillies, really. I can't like them, because they remind me too much of John Kruk and the disgusting looking Nasty Boys pitchers. But as a young baseball fan in 1989, try were the underdogs. The Giants weren't anything like they are today. Really, you could swap the A's and the Giants from then and now. In some ways. But SF was where I saw my first game. And SF is my hometown in my heart, no matter where else I've lived thus far. 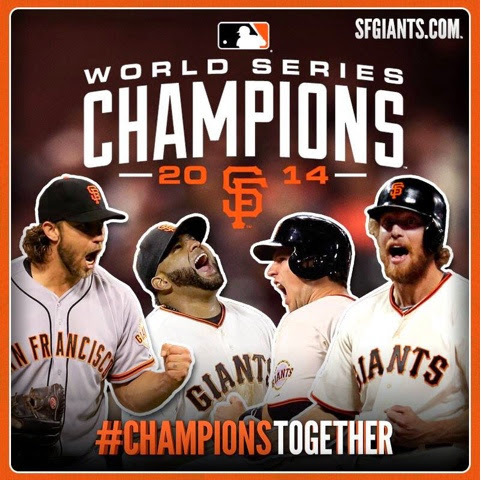 So I was pretty happy to see the news that the Giants won the World Series! Sure, they're somewhat of a dynasty now. But each victory has been as enjoyable as the last. Recent Pickups: The Inserts and Parallels Attack! I don't really buy US cards anymore. Most of my MLB card purchases come from a few runs on Sportlots, COMC, and Just Commons each year. I'm itching to make a couple more purchases in November - Black Friday specials on COMC coupled with cheaper singles from the other sites. My recent entry into the Yahoo Auctions world has netted me a few more US cards recently, but you'll have to wait to see those until they actually arrive. But the cards below were bought at one of the local card stores using my "points". Gimmicky, sure, but I love gimmicks. Inserts with "technology" are cluttering up my want list, and when I needed one more card to use up my reward this became that card. BoChro parallels. My Buck Farmer hunt continues, by the way - I have the gold card on the way now, and I'm bidding on a couple other parallels on eBay. I always want to buy up all the die cut inserts when I see them, too. But I've managed to be responsible and not chase all the Chrome sets with die cuts. A couple more parallels from Bowman. I guess I'm working on a rainbow now for Buck, but one day I'd like to do a full rainbow from one of the Chrome sets. Museum Collection, Triple Threads, and the other high-end sets make their way to Japan's stores and the non-hit singles end up on Yahoo or in card store boxes. Most players don't carry premiums - some big names and the Japanese players end up with a higher price. Other cards can be picked up pretty cheap! Why so many parallels here? My type collection. Keeping up with the MLB issues through online means can be costly - more so than going to shows in the US. The little bargains I sometimes find are certainly welcome! 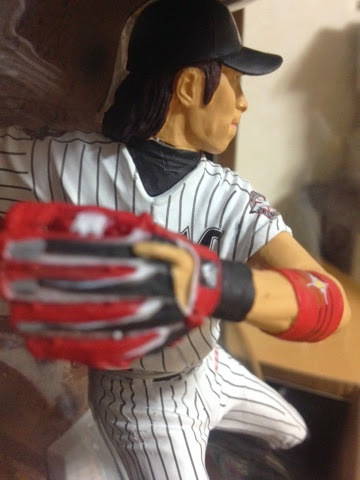 I've picked up a few bobbleheads and other action figures of baseball players while living here in Japan. Some have been MLB issues, and others NPB. 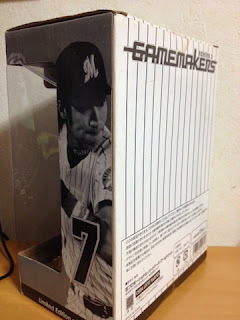 This is my first Gamemakers figure. 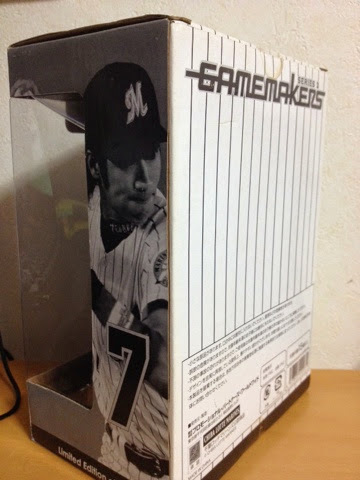 I have a few McFarlanes in the US, and I have a Tony Gwynn figure that I bought a few months ago here in Japan. And McFarlane makes great toys. But this is Japan, a country whose economy is partly based on the sale of high-quality figures. 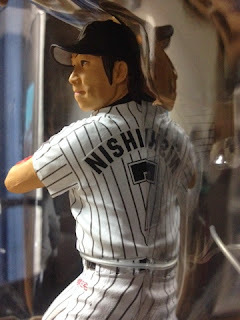 So when the Chiba Lotte Marines want to sell figurines in their store, they're going to do things at least as good as McFarlane does. The attention to detail is remarkable, and this may be more realistic than McFarlanes! It's limited to 1500 figures, and inside there's a nice base for Nishioka to stand on. It's a pretty nice figurine that'll eventually need a nice home in which to be displayed! Idol Card of the Week: Hello Mayuyu! 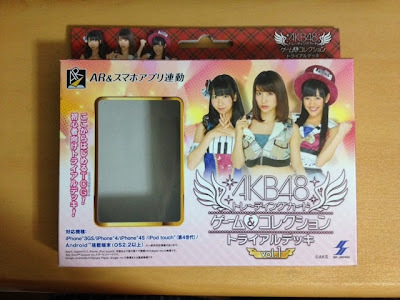 We get back into the pop star card features with this card from the 2012 AKB48 Trading Collection Part 2. I do not know how many series there are in all, though I've seen Part 5 for SKE48. Mayu Watanabe (nicknamed Mayuyu) is my favorite member of AKB48. I do not know why, though. Yeah, she's kind of cute. And there are a lot of other people out there who choose her as their favorite. So I'm not in the minority. She's a bit strange, and is quite geeky - she's an anime nerd. I have a feeling that if she wasn't in AKB48, most guys wouldn't be interested in her... and maybe that's what makes her special. Everybody likes a girl next door. A New PC, and a Card to be Proud Of! You might not know Buck Farmer. But I do. If you look at that biographical stat line at the top of the card, you'll see that he's from Conyers, Georgia. I used to coach baseball there, and he was on our varsity team and in my class! This is the first (and most likely only, unless I return to the US to teach) student of mine to appear on a baseball card. Needless to say, I'm adding him to my PC. The above card is the first I have in hand of his, though I have a few others back home. He has three minor league cards I'm aware of: one from 2013, and two from this season. I have all three of those. Additionally, I've been watching the parallels pop up on eBay and grabbing them when I can. Here is the checklist of all known Buck Farmer cards. Cards with a letter in the left column are ones I have. If you have any non-strike through cards above, or know of any additions/corrections to the list above, please let me know! Bargain Box: 2012 AKS AKB48 "Starter Box"
The semi-local Mega-Donki store has had super-discounted packs the last two times I've visited. At only 10 yen each, I'm willing to buy anything. There is a limit of five, though, per item per person per day. I only bought two of these starter boxes (why didn't I buy more?) which originally retailed for about $30. As you know if you've been reading this blog, AKB48 is the biggest J-Pop group in the world, and the fans can be downright insane. With great popularity comes great amounts of merchandise, found for the group as a whole as well as plenty of goods for individual members. 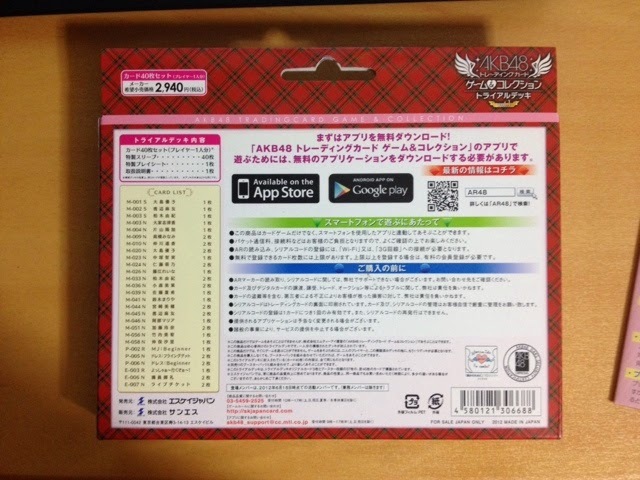 What you see below is the AKB48 Trading Card Game & Collection Trial Deck. It's advertised as "Volume 1" though I've never seen a follow-up (this came out in 2012). The empty box, above. The top card in the pack shows through the window. My favorite member, Mayu Watanabe, is wearing the hat. Those three girls are special in the game. The back describes a bunch of details about the cards and how to use them in an online game. The checklist of cards included is listed on the left; there are forty cards, forty card holders, an instructions sheet, and a game mat. As mentioned in the actual checklist, some of the cards are duplicates in the box. I guess you can clone idols in AKB48 game world. Here are the contents of the box. The card sleeves on the right (special ones with AKB48 logos! 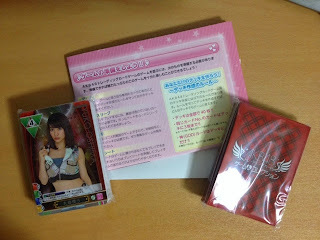 ), and the cards on the left. I mentioned the three girls on the box cover are special: they each have one card in the box which can only be found here, and not in the booster packs. I don't know how the game works. It involves an app of some kind, with codes found on the backs of the cards. I'll eventually get some help to explain this to you all! I also bought a full box of booster packs at a big discount, and I'm two cards away from a full regular set. Again, those full details will come at some other point in the future. Did any of you use Yahoo Auctions when it existed in America? I tried it out a few times, but the US site was seriously lacking compared to eBay. It started in 1998 and lasted for about 10 years in the US, even less in the UK. In fact, it only remains in Hong Kong, Taiwan, and Japan. eBay never got off the ground here. Sellers enjoy the concept of a site that has no fee for listings - eBay has listing fees, final value fees, PayPal requirements and fees. And all those happen for every auction. Yahoo started with no fees at all, though they now charge a monthly fee (about $4) and a flat fee of about 5% on final auction values (with some exceptions), also seemingly calculated monthly. Another problem I think eBay had was payment methods. Japan relies heavily on bank transfers, and the heavy emphasis on PayPal really made things tough. Yahoo does have an online payment system where buyers can pay with credit card or bank transfers through their site, but bank payments are still allowed. Yahoo in Japan feels a lot like eBay did when it was great - relatively simple and fairly user-friendly if you understand Japanese. I usually use the website, but the iPhone app is pretty handy too. The low fees for sellers means prices start fairly low and shipping is via post - 82 cents at the lowest. Now, paying for auctions has a cost. Using Yahoo's system, you can pay a 100 yen (about $1) fee to use a credit card, or 162 yen to do a bank transfer. There is a 0-yen method that I would like to learn how to use, which I think requires going to certain banks and paying at the ATMs there. I'm able to pay using my bank's online system, too - the fee there is 100 yen unless it's to my same bank (those transfers are free). I compare that to eBay - the lowest shipping there seems to be $2, though it's usually $3 or $4 for just one card. Speaking of shipping, I mentioned that dealers generally offer shipping at or under $1 for single cards. I recently received a 24-card set shipped for $1, and the three thick cards you see below were shipped for $1 total. I just won a 95-card set where the seller is charging $2 for basic shipping. So, what have I been buying? Not that much, really, and it's mostly been cheap stuff. I bought my second and third series Calbee sets off Yahoo. In the past couple weeks I've been learning about how to make payments and using the communication system. Shipping addresses and such need to be typed in to each dealer, as well as telling the seller which bank the money was sent to (many sellers have multiple banks). With help from a coworker, I've essentially developed a form letter that I copy from auction to auction. 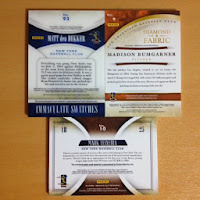 My first multi-auction win is a group of three cards from Immaculate Collection. I was bidding on another card that I didn't end up winning. One of those is numbered to 49, and all three will fit in my type collection. Combined with shipping and payment fee, these cards cost me under $5. I can certainly see myself using Yahoo for MLB and NPB single cards as I get better and better at using the site. Much like eBay was wonderful for my collections in the late 1990s through mid 2000s, Yahoo opens up a whole world of merchandise in my (not-so-)new country. 1964 Morinaga Top Star: Awesome Find! Does this look like any other bromide I've featured on the blog? Well, technically, I guess it is. What you see is from the 1964 Morinaga Top Star set. Identified as JF2 in Engel's guide, it's the non-die-cut version of cards issued by Morinaga, a major candy company in Japan. The die-cut cards are identified as JF 1 (1964 Morinaga Standups). JF1 is designated "R2" rarity (100-249 known copies) while JF2 is "R1" (250-1000 known copies). However, both sets have a few scarce cards, for whatever reason. Fronts from both sets share identical photos and both have pure fronts without any text. 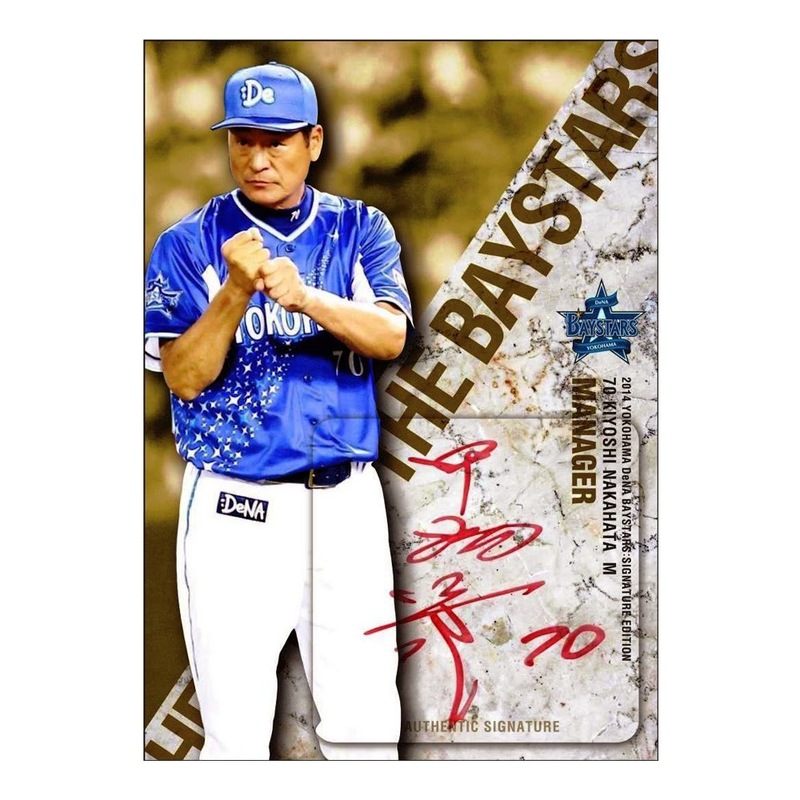 Yasumitsu Toyoda's card is one of two super-scarce cards in the JF2 set. I paid about $15, though it "books" for $250! I lucked out here - I just skimmed through the cards available at the store and grabbed the one that appealed most to me. Backs have black text on the white card stock. The top line says Morinaga Top Star Card in Japanese, and the text below that hints that they were issued along with gum of the same name. The Morinaga logo is at the bottom along with company information. I have established a regular route around Akihabara, going from a card store, swinging by some arcades to check out the UFO Catchers (crane games), stopping for lunch before heading back on my loop toward the station and a few more arcades. Along the way, I've discovered a few stores that sell things I'm interested in (especially trading cards), and my mood (and wallet) sometimes inspires me to poke around a couple as I make my rounds. I stopped at one such store a couple weeks ago and ended up walking out with two sealed boxes of trading cards, one single card, and a repack. The repack was almost entirely Calbee, and for the price with two limited cards showing there was no way I was passing it up. I'm not building older Calbee sets. It's just way too hard and I have too many other priorities in collecting ahead of such an undertaking. Trust me when I say that building a full run of Calbee baseball cards is more difficult than building a full run of Topps baseball cards. The cards above are presented in the order they were in the pack. Did you notice the Ichiro and Matsui cards from 15 years ago? And all the limited inserts? It's no 1970s Calbee shoebox find but there are some great cards here. I'm not sure yet if I need any of them for my type collection - most likely it would be the checklists toward the end of the pack or the foreign players. I think I'll keep ahold of these (unless anyone needs them in trade) just in case I do decide to build Calbee sets in the future!